What Happens to Your Tax Refund in a Debt-Ceiling Stalemate? Expecting a federal tax refund? Perhaps you should hurry up and file. As House Republicans struggle to coalesce around a strategy for embracing an increase to the nation's $17 trillion-plus debt ceiling so the nation can keep paying its bills, Democrats on the Ways and Means Committee are floating a new bogeyman if the delay continues. A wave of bank runs by worried depositors was blamed for helping to drive the United States even deeper into the Great Depression in the 1930s. Now, suggest the Democrats, there could be a potential "panic" when Americans in upcoming weeks file their income-tax returns, particularly if fear builds that the Treasury Department might not be able to immediately refund all that it owes to taxpayers. "Failure to act quickly [on the debt ceiling] will endanger our economic recovery and send a signal to American taxpayers that their refunds may be in jeopardy, potentially raising unnecessary panic among families awaiting their tax refunds," wrote the Democrats in a letter Monday to Speaker John Boehner, R-Ohio. The letter was circulated by ranking member Sander Levin, D-Mich., and signed by other Ways and Means members. The letter goes on to say, "Past Republican default threats" have cost Americans hundreds of billions in lost retirement savings, increased the costs of owning a home, and even jobs. "Let's not add delaying refunds to the list," the letter states. "First come, first served," said one senior Democratic aide on Wednesday of the millions of refunds paid out each year, adding that "Treasury can only pay out what it has." In fact, Boehner has made it clear that he and other House Republicans do not intend to let the nation default on its bills, and that they will pass a debt-ceiling increase. But the question remains: How soon can he and his conference agree on how to proceed? Administration officials are already warning that the Treasury Department will run out of "extraordinary measures" to keep government afloat by the end of February if Congress does not approve the hike in the nation's borrowing limit. Democrats are now suggesting that timeline might become even more contracted if there is a greater-than-usual number of tax filers in the coming weeks. The filing period began Friday--already a week later than usual because of the government shutdown last year--meaning that some filers have been antsy to get going. Democrats are preparing a "fact sheet" outlining this tax-refund doomsday scenario, said the aide. 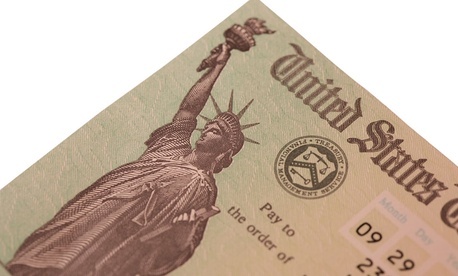 The fact sheet will note that 110 million Americans received tax refunds in 2013, averaging $2,700 each. It will also point out that 40 to 50 percent of refunds generally are distributed by March 1. To back up their history, they point to two filing-session charts from the Internal Revenue Service, for March 1 of 2012 and 2013 , and for the end of years 2012 and 2013. Democrats say they are now monitoring to see whether there is a heavier-than-usual volume of first-week filings. The upshot of their strategy is that House Republicans who are worried about getting slammed by constituents for passing a clean debt-ceiling increase should think about something else: constituents getting angry over delayed tax refunds. Boehner's office had no immediate comment Monday on the Democratic strategy or the letter. And a Treasury Department spokesman responded only by pointing out that Secretary Jacob Lew has previously stated--regarding potential tax refund delays--that "we ought not to be doing things that interfere with the ability of the government of the United States to meet all of its obligations on a timely basis." This article appears in the February 6, 2014, edition of NJ Daily.